The amount of waste on the move is increasing rapidly. Reports to the Basel Convention on the control of transboundary movements of hazardous wastes and their disposal suggest that between 1993 and 2001 the amount of waste crisscrossing the globe increased from 2 million tonnes to more than 8.5 million tonnes. What is this material that is being traded between countries, where is it from and where is it going? 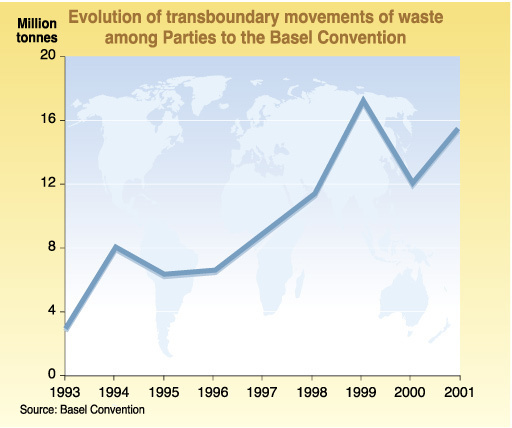 Unfortunately data on waste movements are incomplete – not all countries report waste movements to the Basel Convention. 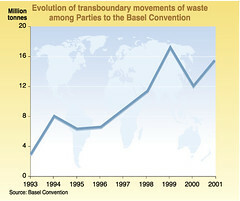 However, we do know that the movement of waste is big business.